Why is a social media calendar important? Content calendars are important for the same reason it’s important to have a personal calendar. It helps you keep track of things that are coming up, things that you have to prepare for, and things that you might need to reschedule. When it comes to creating a social media content calendar, it allows you to schedule and craft your social media posts around important events, dates, holidays, etc. In the long run, having this calendar prevents you from scrambling last minute to come up with a post to share with your followers. Not only does creating a social media calendar cut down on stress, but it can drastically cut down on planning time — since you’ll already have an idea of when you need to post and for what date and event. Every business is different, and every brand’s social presence is different. That means that every social media calendar will differ, too. It’s your job to determine, based on your industry and niche, how often you should post and what kind of content you choose. However, the basics of every social media calendar are the same. All too often, businesses post to multiple social platforms just for the sake of posting. What they don’t realize is the time spent on choosing what to post to the platforms that don’t perform can take away valuable time from bettering the platforms that perform the best. Before you create your social calendar, evaluate your social platforms to determine which ones are worth your time. For some industries, LinkedIn isn’t beneficial or necessary, while for other industries, Pinterest may be worthless. It all depends on your audience. In order to post content that is the most beneficial to your audience, you must take inventory of who that audience is. Start by creating a spreadsheet that lists out all your active social media platforms. Then, using analytics, determine the demographic of those who interact most with your posts. Don’t be surprised if your audience demographic is similar across all platforms — it’s always good to check. This will help you determine exactly what kind of content you should post on each platform. Taking a quick peek at your competitors’ social profiles can benefit your strategy greatly. Comparing your strategies to theirs is helpful because your social media campaign can probably benefit from the same strategy. Note how often they post to each platform. Also, take note of what kind of content they’re posting. Are they getting tons of shares on their videos? Do they have tons of retweets on their photos? Of course, you never want to post the same exact content as your competitors, and you certainly don’t want to retweet or share their information. However, paying attention to what they post and how often can be huge in helping your social accounts grow. After checking out what your top competitors post and how often, you have all the information you need to create a list of content for your own accounts. When you’re putting together your list, don’t feel the need to denote specific content articles right away. That will come later. For now, just post the content type, and how often you think you should post that kind of content on each platform. Keep in mind that all platforms work differently and get different kinds of interactions. So what works on Facebook, a text-heavy social platform, might not work well on Instagram, which is heavily image-focused. Now that you’ve determined the kinds of content you’ll post on each platform, it’s time to create a collection of content. This can be the tricky part since some content is time-sensitive and content calendars plan your posts in advance. The best way to keep timeliness from being an issue is to separate your content into “time sensitive” and “evergreen” categories. Your time sensitive content is content you know you have to share by a certain date, while evergreen content can be used to fill the gaps. Collecting and curating content may sound daunting, but it’s super simple! Just keep your URLs organized in a Google doc with a heading of “time-sensitive” articles and “evergreen” ones. You could also opt to keep your content collection in a spreadsheet. One last tip — don’t forget to include your own website’s content in your content collection! Sometimes company’s get so caught up in posting scholarly articles or reposting someone’s industry video that they forget about their own blogs and videos. Posting your own content is one of the best ways to increase website traffic, and that’s something you don’t’ want to miss out on. It can also help if you organize your “timely” and “evergreen” content into content types like long-form and blogs. This will help when it comes time to schedule your content. There are any number of ways that you can go about creating a content calendar for your social media accounts. Personally, I like to keep it simple. I’ll open a Google sheet and create a tab for each upcoming month. From there, I’ll color code each social platform, so at a glance, I can tell how many times I’ll be posting on a certain platform in any given week. Spreadsheets also work well as calendars because they allow you to see every day side by side, and even plan what time of day you want to post. After looking over the post frequency you decided on, go platform by platform to create your calendar. For example, start with Facebook. If you decided that you want to post to Facebook four times per week, use the color you chose to represent Facebook, and put it randomly on your calendar four times each week for the month you’re filling up. Do the same with every other platform. Then, look back at the kinds of content you want to post. If your Facebook profile is to get one blog and two long-form articles per week, simply go back to your content spreadsheet and select the URLs that match. You can add these as a comment in the cell. Repeat this process for every platform. Buffer is by far one of the best automation tools for social media. 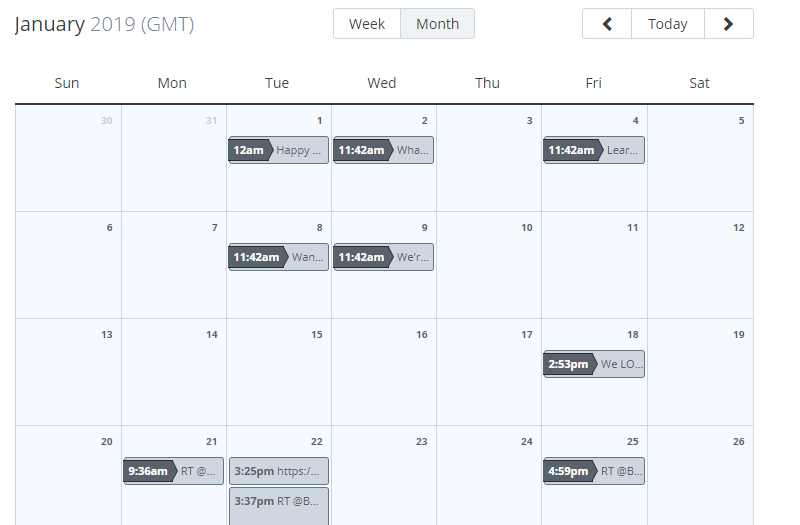 It allows you to add all your social profiles in one place and schedule each post for a specific day and time. After your calendar is finished, consider using Buffer to load up all your content. It’ll post it for you, automatically, on the day that you schedule. If you’re overwhelmed with social media as a whole, or just overwhelmed with the thought of creating a social media calendar for your company, WebFX can help. We’re a full-service Internet marketing agency located in Harrisburg, PA. With over 200 in-house experts, you’ll have all the help you need with your social media campaign.